A smaller, prettier and lither Golf; what could be better? Well in the case of the Volkswagen Scirocco, not a lot it would seem. A smaller, prettier and lither Golf; what could be better? Well in the case of the Volkswagen Scirocco, not a lot it would seem. First unveiled to the public back in 1974, there followed another generation of practical but pretty hatchback/coupé before its successor arrived bearing a Corrado badge. 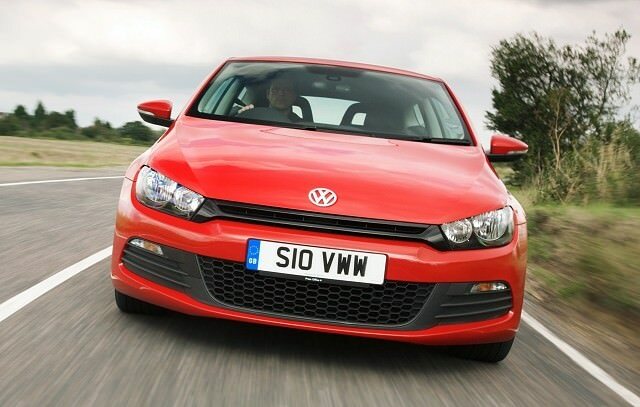 A successful car in its own right, Volkswagen soon realised it was missing a retro trick, and in 2008 revealed the latest in the long line of sports coupés based on its best-selling Golf platform, this time once again bearing the legendary Scirocco name. There’s not much to choose from here, as the Scirocco only comes in one body style - with three doors and a look that sits somewhere between a coupé and a regular hatchback. Whatever your pigeonholing though there’s no doubt the Scirocco’s design works, looking sleek and elegant no matter which trim you opt for. Talking of which, you’re rather left without options on this as well - the Volkswagen is only available in Sport trim, though there are a decent choice of engines. Petrol fans can choose from the 120hp 1.4 or 210hp 2.0-litre TSI engines as fitted to the Golf GTI. Those after even more performance will notice the occasional Scirocco R model for sale from the United Kingdom (with the associated extra costs involved), which use a tuned 2.0-litre turbocharged petrol engine with 270hp. Far more sensible is to pick one of the diesel models - both are 2.0-litre four cylinders but come in different states of tune, either with 140hp or 170hp. BlueMotion technology on the 140hp version makes it super economical and efficient, and even this model can sprint from 0-100km/h in 9.3 seconds. There is at least a choice between gearboxes - a smooth shifting six-speed manual or the firm’s acclaimed DSG dual-clutch gearbox. Either is great, though we’d probably opt for the DSG, especially with the high power diesel engine. To be honest any engine is a great choice here, but for taxation reasons we’d stick with either the 1.4 petrol or lower power diesel. With the latter it still boasts 140hp but with a manual gearbox only emits 127g/km and can return 5.1 litres/100km - which makes it a winner in our books. With only one specification to choose from its best to look for a car with some decent extras - look out for leather trim and satnav, and steer clear of white cars, as there are just too many of them around now and your eventual resale value will suffer. There are better looking coupés out there (the Audi TT and Peugeot RCZ are certainly sleeker models from the same sector). However, in part this is the Scirocco’s trump card; while it manages to look more interesting than the Volkswagen Golf, it retains the ability to seat four (relatively) comfortably - something neither of its rivals manages. In short, it’s a consummate all-rounder and well worthy of your attentions.